Mouse anti peptidoglycan antibody, clone 3F6B3 (7263-1006) used for the detection of Bacillus cereus or Staphylococcus epidermidis derived biofilms by innunofluorescence. Testing the Hypothesis of Biofilm as a Source for Soft Tissue and Cell-Like Structures Preserved in Dinosaur Bone. Mouse anti Peptidoglycan antibody used to detect spirochetes in the brain of a patient with Lyme neuroborreliosis by immunofluorescence. exposure of primary neurons (compare with Fig. 4G). C: Spirochetes showing loop or ring-shaped formations (arrows) in the cerebral cortex immunostained with a polyclonal anti-Borrelia burgdorferi antibody (Biodesign, B65302R). They are similar to those of Treponema pallidum (arrows in D) observed in the cerebral cortex of a patient with general paresis. Immunostaining was performed using a polyclonal anti-Treponema pallidum antibody (Biodesign, B65210R). E: Helically shaped OspA immunoreactive spirochetes in the cytoplasm of a cortical pyramidal neuron. In addition to one more typical form (arrow), fine OspA positive minute granules along filamentous forms are seen. F: Intracellular ring-shaped forms (arrow) showing positive immunoreaction with a polyclonal anti-Borrelia burgdorferi antibody (BB1017). They are identical to those observed in chicken primary neurons infected with Borrelia (compare F with Figure 4D). Near the asterisk a large strongly immunoreactive cyst form is visible. Spirochete forming loop in the cerebral cortex (G) and in the cytoplasm of an epithelial cell of the choroid plexus (H) are seen as visualized by anti-OspA and anti-bacterial peptidoglycan antibodies, respectively. I: A similar atypical spirochete forming loops in the cerebral cortex as visualized with Thioflavin S. J: In an area with colony-like spirochete aggregation in addition to some typical, regularly coiled Borrelia spirochetes (arrow) OspA positive cystic forms (asterisk) are seen. K: In the cerebral cortex near the colony-like spirochetal agglomerate a spirochete cyst (asterisk) similar to that observed in vitro is visible (compare it with Figure 5 G-J). Immunostaining was performed using a monoclonal anti-OspA antibody. Bars: A = 20 μm; B-J = 10 μm, K = 5 μm. From: Miklossy J, Kasas S, Zurn AD, McCall S, Yu S, McGeer PL. Mouse anti peptidoglycan antibody, clone 3F6B3 (7263-1006) used for the identification of peptidoglycan containing cells in normal and Chron's disease tissue by immunofluorescence. APCs in the NAP pathway show defective PD-L1 expression in Crohn's disease. (A) Representative fluorescent micrographs showing M cells (identified by glycoprotein 2 staining; yellow) in the epithelium overlaying lymphoid patches in Crohn's disease and control sections. Scale bars are 50 μm. (B) Typical confocal micrographs demonstrating the presence of peptidoglycan (Pg; magenta) in nanomineral positive cells (identified by calcein; green) in both Crohn's disease and control sections. Scale bars are 10 μm. (C) Example confocal micrographs of Crohnμs disease and control ileal lymphoid patch cells showing that APCs from control tissue are both nanomineral (calcein-stained, green) and PD-L1 (red) positive, but Crohn's disease associated APCs are nanomineral positive and PD-L1 negative. Scale bars are 10 μm. (D) Percentage of nanomineral (calcein-stained) and PD-L1 positive cells in control and Crohn's disease tissue (Crohn’s disease versus control: p < 0.0004 using the Mann-Whitney test). Data are shown as mean + SD. In all cases samples were tested from 6 independent tissues for Crohn's disease and 9 independent tissues for control tissues. 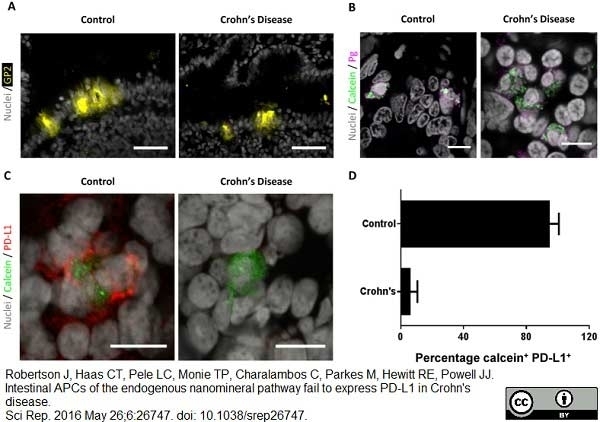 In total 177 calcein (nanomineral) positive cells were identified in the Crohn's disease samples, and 191 calcein (nanomineral) positive cells in the control tissues. From: Robertson J, Haas CT, Pele LC, Monie TP, Charalambos C, Parkes M, Hewitt RE,Powell JJ. Intestinal APCs of the endogenous nanomineral pathway fail to express PD-L1 in Crohn's disease. Sci Rep. 2016 May 26;6:26747. Mouse anti Peptidoglycan antibody, clone 3F6B3 recognizes the 3D polymer complex structure of peptidoglycan (PG). In a competitive immunoassay format, several compounds were found to be ineffective as inhibitors; muramyldipeptide, N-acetylglucosamine, chitin and acid hydrolyzed chitin. The epitope appears to consist of discontinuous glycan and/or amino acid residues. This antibody was raised against insoluble peptidoglycan obtained by TCA-heat and ethanol extraction of Streptococcus mutans BHT cells. 1Treatment with strong acid, for Gram positive bacteria, or with a detergent, such as SDS, for Gram-negative bacteria may be necessary to expose the epitope. 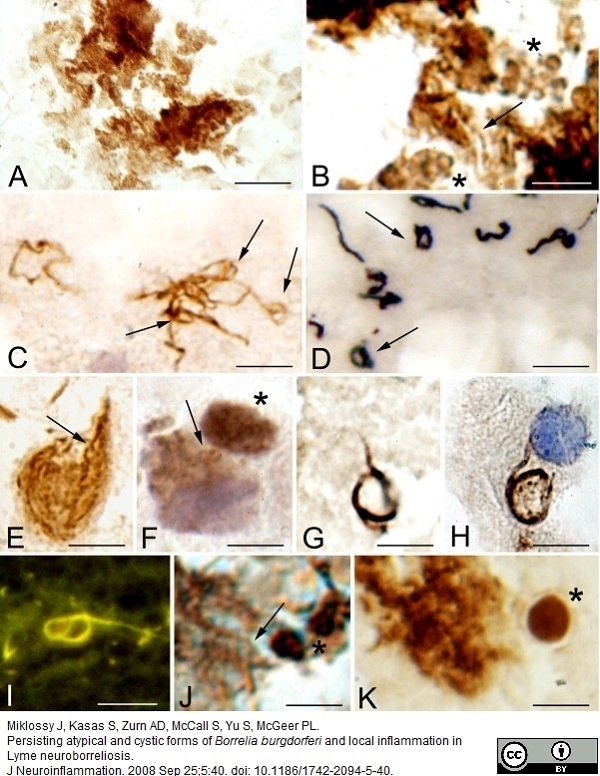 Miklossy, J. et al (2004) Borrelia burgdorferi persists in the brain in chronic lyme neuroborreliosis and may be associated with Alzheimer disease. J. Alzheimer&#39;s Dis. 6: 639-649. Wu, L. et al. (2007) Bacterial peptidoglycan breaks down intestinal tolerance via mast cell activation: the role of TLR2 and NOD2. Immunol Cell Biol. 85: 538-45. Rennemeier, C. et al. (2007) Thrombospondin-1 promotes cellular adherence of gram-positive pathogens via recognition of peptidoglycan. FASEB J. 21 (12): 3118-32. Schweitzer, M.H. et al. (2016) Testing the Hypothesis of Biofilm as a Source for Soft Tissue and Cell-Like Structures Preserved in Dinosaur Bone. PLoS One. 11 (2): e0150238. Miklossy J et al. (2008) Persisting atypical and cystic forms of Borrelia burgdorferi and local inflammation in Lyme neuroborreliosis. Robertson, J. et al. (2016) Intestinal APCs of the endogenous nanomineral pathway fail to express PD-L1 in Crohn's disease. Miklossy, J. (2016) Bacterial Amyloid and DNA are Important Constituents of Senile Plaques: Further Evidence of the Spirochetal and Biofilm Nature of Senile Plaques. J Alzheimers Dis. 53 (4): 1459-73. The Open Pathology Journal. 2 (1): 86-95. Van Gerven, N. et al. (2014) Secretion and functional display of fusion proteins through the curli biogenesis pathway. Mol Microbiol. 91 (5): 1022-35.